“Thinking that Sreeradha has discovered her way to freedom, she signed and received the posting order. She did not think that she was being made into a slave. It is not at all a problem to the owner of the company that she maintains her independence of self. She is happy to have got a way opened. She would be speaking now onwards in a calculated way and put forward each step. She would be led by this concept in her sleep and wakefulness. She has not realized there is no life for an individual without the social acceptance. For she has spent, her childhood, adolescence, and , early youth without a sense of down to earth, existence. Who ever not know that, youth is a time of being ness and independence, when the society turns against her she accepts new mischief as others. There when she leaves for a north town, she pretends that she is happy, and independent in each moment. 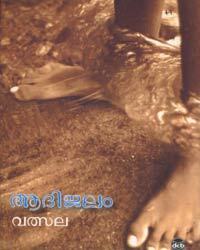 “Excerpt from the novel, Aadijalam. “They did not speak each other. The words of the Bengalis flew away in spite them. “This, job of sitting in guard of the God was given by who? Nobody, but fell upon my shoulder itself. The boatman announced, it is time! Time over! So soon? Time to return? Are we happy? Anwar spurted ou. Sreeradha stretched out her hand to calm him down.